They were pretty much right on the money there! Every week, Capitol Records took a full-page ad in “The Billboard”. This weekly ad allowed them to tout their new releases, and brag on the ones that were selling–which was a lot of them. The center of the ad would usually feature whichever disc they were really trying to push. 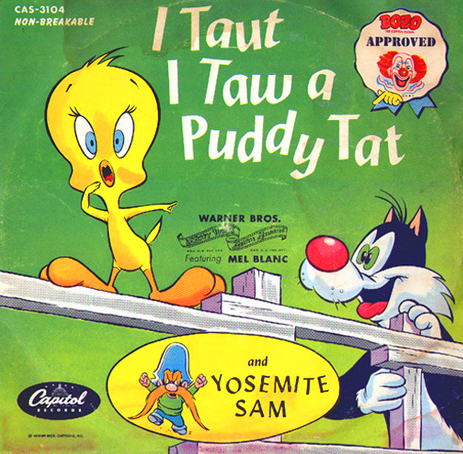 In “The Billboard” of January 13th, 1951, the primary position in the ad went to Mel Blamc’s record of “I Taut I Taw A Puddy Tat”, now coupled with “Yosemite Sam” on Capitol 1360 (78) and F-1360 (45). Two weeks later, the tout paid off. ‘I Taut. . . ” entered two of the three charts that “The Billboard” kept to gauge how popular records were doing with the public. The disc entered both the “Best Sellers In Stores” chart, as well as the “Most Played by Disk Jockeys” listings. Mel’s platter did best with retail customers, getting up as high as #9,and spending eleven weeks in the Top Thirty. It didn’t do too badly with the men who spun discs on the radio–getting as high as #13, and spending seven weeks on that chart. Can you imagine the reaction of hard-core inebriates if they were to hear Mel’s read on Tweety and Sylvester while they were getting progressively more schnockered? ‘Taint a pretty picture, is it? The week after the record entered the “Billboard” charts, the song appeared on “Cash Box”‘s chart of the forty top songs. It only spent five weeks in the Top Forty, getting as high as #20. There is, however, one other “Billboard” chart that concerns us. Beginning in June, 1948, “Billboard” kept a chart of the top-selling children’s records. This chat was already well and truly dominated by Capitol releases, of almost all kinds. 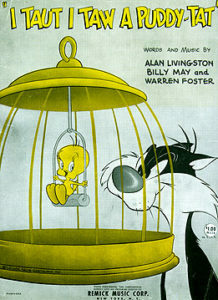 During the Puddy Tat’s third week on the grownup’s charts, the diesc debuted at #7 on the Kiddie charts. 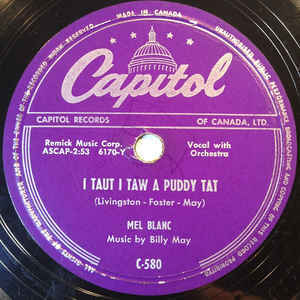 And, in its fifth week on the moppet hit parade, Mel’s disc hit #1, knocking off longtime favorite “Tweety Pie’, a storyteller by–but, of course–Mel Blanc. It got knocked off the poll position for a couple of weeks, making room for Gene Autry’s “Peter Cottontail”. But when the rabbit hippety-hopped down the Bnny Trail after Easter had passed, the Puddy Tat came back to the to of the ‘kidisc” charts. In all,”I Taut. . .” was on the charts from February 10th, through to July 28th (inclusive). It dropped off a week, then came back for another four weeks. Naturally, when a record looked like it was going to be a hit–other companies would rush I with their “covers” of “I Taut I Taw A Puddy Tat’… and we shall look into that next week. The days BEFORE Warner Brothers started their own record company.